It's Time for Celebrations » What's Under the Needle? It's that time of year again and we all have things to celebrate. Sometimes we forget to record those times in a tangible way. A fun way to record a special occasion is with a wall hanging. Ideas include a family gathering or reunion quilt, a door quilt for a child’s room, an anniversary quilt, a graduation quilt, a wedding quilt, and a memento quilt. While you're busy with all the preparations over our festive time, why not start collecting little memorabilia for your next wall hanging and when things quiet down, you'll be all set to make a wonderful quilt. 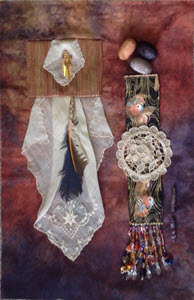 Anita Eaton has created several pieces which show various occasions and uses of smaller wall hangings, or door quilts, to use as decor. She has developed a workshop to show many ways to develop your own special design. Today her workshop has 25% off so you may want to sign up now as being an on-demand workshop, you can start any time! PS: For those of you who are a little afraid to design your own unique project, Anita also provides two patterns to embellish yourself.